Normally we here at CETFA review the new NFACC codes of care as they are released and provide detailed comments for our supporters to use as a guide while providing their own input during the public comment period. We have to say that we are sickened by the draft code for egg-laying hens and aren’t even able to break it down to simply some sections that need improvement. The entire draft is short-sighted and requires a massive overhaul. The code is suggesting that Canada follow in the footsteps of the European government, when in 1999, it recommended a move to “enriched” or “furnished” cages over cage-free systems. These cages continued to be so small and crammed that birds were still unable to fully spread their wings, and when perches were provided (many producers simply stopped cleaning and replacing them) the birds were unable to use them because they couldn’t stand upright without hitting the roof of the cage. In the end, the retailers and supermarkets, pushed on by an awakened public, banned the cages themselves. Back here at home, a recent poll showed that 79 percent of Canadians believe that cages for hens should be banned. Eighty-three percent said they would support a law that prohibited their use. So why is NFACC not listening to Canadians and protecting farmed animals – as its mandate states? We suggest putting that question to NFACC directly when you submit your comments on the draft codes through NFACC’s online system here. 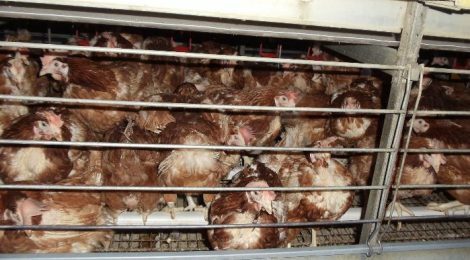 Make it clear that whether called “enriched” or “furnished”, a cage is still a cage.